It’s not a good feeling when your Uber driver tells you he doesn’t know where you are on the map. In this case, it was entirely my fault. I’d asked him how he liked the new Uber Navigation feature, and he opened it on his phone so he could show me how confusing it was. “You have to assume where you are,” he told me. The map on his phone just showed a red line cutting through Brooklyn, with no obvious indicator of where the car was along the route. At the top of the screen, the app told him to turn in 500 feet. “It doesn’t show the grid, it’s very confusing,” he said shaking his head. He flipped back to Waze and we continued our trip. [W]e’re excited to introduce a redesigned navigation experience built around drivers’ needs. We’ve completely revamped navigation on iOS and are introducing in-app navigation on Android for the first time. Now, with one-tap, turn-by-turn directions start right away, saving time and eliminating the need to juggle multiple apps. There’s just one problem for Uber. We couldn’t find a single Uber driver who uses it. During several trips around New York City, I asked Uber drivers about the new feature and their driving experiences. Most use Waze, citing its traffic re-routing and speed trap feature as being particularly helpful, and all had bad experiences with Uber Navigation in the past. Uber says it won’t require drivers to use its new Uber Navigation system, but it seems to have a number of hurdles to overcome to convince its drivers to give it another chance. Uber drivers really depend on their mapping tools as they travel around unfamiliar areas. Mapping from scratch is difficult to do, something that Apple discovered very publically when it launched Apple Maps in 2012 to compete with Google Maps and got slammed with #ios6pocalypse for mislabeling major locations. After a few years, Apple Maps is now a seriously good mapping option, which happened after the company spent some time updating location information and getting public transit directions. Although Uber isn’t going to need public transit directions in its features, listening to driver complaints about things like one-way streets and turning lanes could go a long way. And it’s not just the Uber drivers in New York that don’t like Uber Navigation, it’s the passengers too. “Before I used to go to Google Maps,” Shavkat says. “Now passengers ask for Waze.” The app is more accurate in the city, and the traffic information makes the trips faster, he says. Uber made this gif to demonstrate how they imagined the app as part of the design process on Uber Navigation. “I saw that they launched some new maps on the driver side, but frankly I think a lot of drivers still use Google Maps or Waze,” says Campbell. “I think the real value for [Uber] when it comes to launching their own mapping system is to optimize the pickup and drop-off situations better.” Campbell can imagine if Uber Navigation can incorporate what side of the street a driver should be on, and the direction they are going, it could become a really valuable resource. “Existing maps are a good starting point, but some information isn’t that relevant to Uber (e.g. ocean topography) and other things we need to know a lot more about (e.g. precise pickup and dropoff locations),” an Uber spokesperson tells Inverse in an email. Uber Pool in particular is dependent on Uber Navigation with Android phones, because it re-routes every time someone gets added to the pool to make the route efficient. But drivers haven’t really experienced detailed information in Uber Navigation so far. “If you use Uber Pool you have to use Uber Maps, but they sometimes tell you to turn where there’s no turn,” says Kedir, an Uber driver in Manhattan. He prefers to use Waze because it tells him where the traffic is and doesn’t kill his phone battery, which he has found problematic with Uber Navigation. When he uses Uber Navigation for Uber Pool he often finds that it can’t find the exact address for passengers. And for professional drivers, Uber might need to add some features if it really wants to convert its drivers. Kedir says he has been a fan of Waze since he started driving for Uber two years ago. “It gives you all sorts of other things, like police hiding.” Since Uber’s gotten a lot of slack for “greyballing” cops and preventing them from getting rides, probably that’s a feature that won’t show up in Uber Navigation anytime soon. 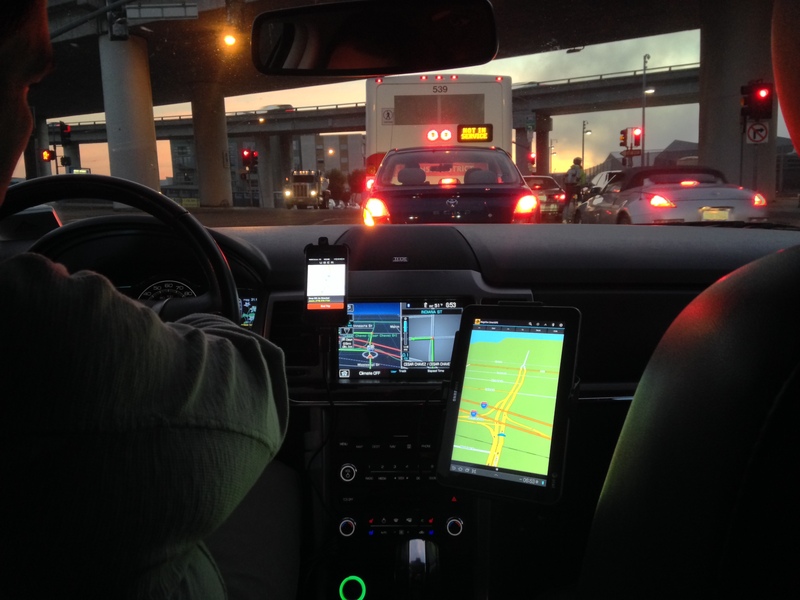 A few days after the announcement of the new features, Brian McClendon, the vice president of maps at Uber, announced that he will be leaving the company. Although Uber Navigation is looking a little rough right now, updating the system based on user feedback is a process that worked well for Apple Maps. If Uber can figure out how to give drivers better experiences with picking up and dropping off passengers, as well as nailing down how the directions appear on the screen, it could have something really useful on its hands.